Panorama is a vibrant and growing community on the South East area of Newton, Surrey (the one in Canada not the UK!). Some parts of our 'hood are called Sullivan, Sullivan Station, Sullivan Heights and Panorama Village. 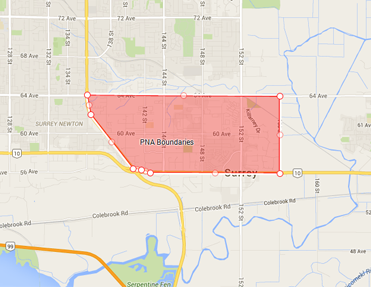 Our community association's boundaries are from 156th Avenue to the East and King George Boulevard to the West and from Highway 10 to the South to 64th Street to the North. We were formed to represent and connect residents in one of the fastest growing areas of Surrey which is itself the fastest growing city in British Columbia. The Panorama Neighbourhood Association was formed in 2012 and is officially registered as a Non-Profit Society with the BC Registrar. For more information on our mandate and bylaws, view here. For more information on our board, view here.